Variously described as a satire or hoax, this work took the extreme position that those who dissented against the Church of England should be killed due to their negative political influence. The difficulty in categorizing this work comes from Defoe using the language and rhetoric of the Anglicans who actually held the beliefs he imitated. 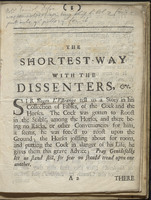 Dissenters and nonconformists were those whose religious practice differed from that of the official Anglican Church. The issue of conformity was prominent as nonconformists were ineligible to hold government positions. Defoe was himself a Presbyterian dissenter, a sect associated with the Church of Scotland. This work ultimately led to Defoe being tried and found guilty of seditious libel, resulting in his incarceration in Newgate Prison and spending three days in the pillory. 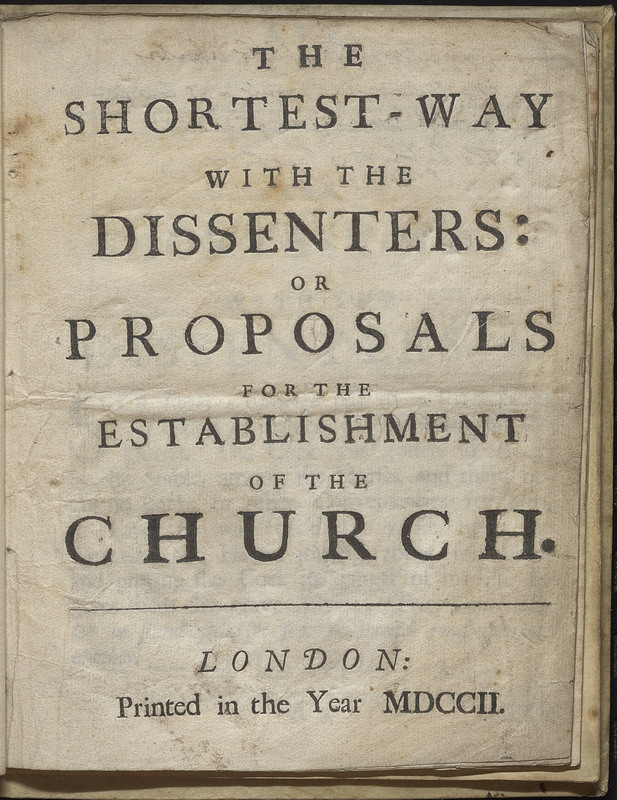 The Shortest-Way with the Dissenters: or Proposals for the Establishment of the Church. London: [s.n. ], 1702.